At first, hearing loss seems really subtle. If you know what to look for, though, you can start to see what is happening with your elderly family member’s hearing. From there, you can ask her doctor to take a closer look at what’s happening. 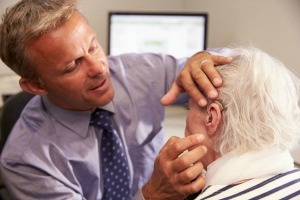 Homecare Milton GA – What Does Hearing Loss Look Like? “Chronic lyricosis” is a joke illness in which sufferers mishear lyrics to their favorite songs. But in normal conversation, this is something that can indicate to you that your aging adult is experiencing at least a little bit of hearing loss. Mishearing words can cause your senior to respond in ways that don’t make sense to you and to other people. In groups, voices can blend together and cause words and sentences to seem to run together. This makes it tough for your aging adult to participate fully in group conversations. She might pretend as if she’s not interested or withdraw. Or she might avoid group settings altogether. Higher pitches, especially higher-pitched voices, are more difficult to hear for many people with hearing loss. This might mean that your senior can hear some things, like most of her favorite television show, but might not be able to hear someone speaking to her in a normal voice if it’s toward the higher end of the spectrum. You might not realize, but how your senior moves can tell you a lot about her hearing. Because the inner ear is responsible for helping your elderly family member maintain her balance, she might be a bit wobbly. She may not even notice that she’s more off balance than usual, but you might if you’re paying close attention. When your elderly family member’s hearing is suffering, she may suddenly start to complain about everyone she encounters mumbling. She might also have common complaints about how people on television never speak clearly any longer. All of these complaints might seem like nothing individually, but the rest of the world didn’t suddenly start mumbling all at the same time. This is an indication that her hearing has changed. People with hearing loss can use a little extra help to get through their day. Having homecare providers available for your senior family member can be a huge assist. A homecare services provider can also teach you a few things about making communication with your elderly family member a little bit more effective. If you or an aging loved-one are considering Homecare Services in Milton GA, please contact the caring staff. Email: info@realmccoyhc.com • Phone 404-536-1060. The Real McCoy Home Care is your locally owned and managed in-home, non-medical home care agency. Serving North Metro Atlanta.